Home » Markets » Phoenix Capital Research: Why Should you be Freaked Out About Stock Market? Phoenix Capital Research: Why Should you be Freaked Out About Stock Market? [Phoenix Capital Research, Via Zero Hedge.] 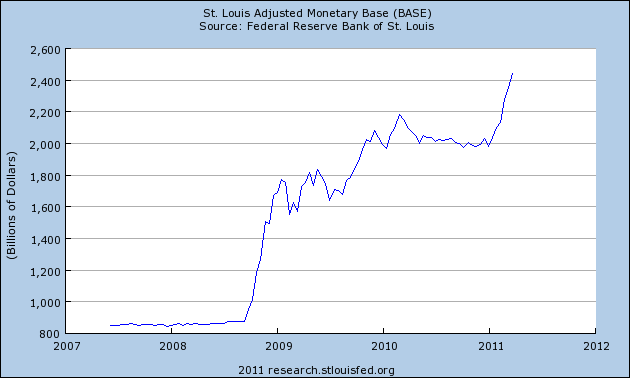 This is a chart of the US monetary base. In simple terms, it charts how much money the Fed has pumped into the system (at least that it admits). So it’s a kind of visual of the Fed hitting the PANIC button: when the monetary base explodes higher, the Fed is FREAKING out. You’ll note that during the Financial Crisis the Fed didn’t do much until the autumn of 2008 when it pumped nearly $1 trillion into the system. Think about that, the Fed didn’t go nuts pumping money until the stuff REALLY hit the fan. You’ll also note that there’s only one other time when the monetary base went absolutely vertical: TODAY. Indeed, the Fed has pumped nearly $500 billion into the system since the start of 2011. Don’t even try to tell me this is QE 2. If it was then the monetary base should have spiked in late 2010, NOT in 2011. No, this is the Fed FREAKING OUT about the financial system again. And it’s a freak out on par with 2008. So if you think that all is well “behind the scenes” you’re in for a rude surprise. Something BIG is going down and it’s NOT good. And rest assured, by the time the mainstream media announces what it is, it will already be in full swing.